My first full day in Puebla I attended the 2nd annual FMGM (Foro Mundial Gastronomia Mexicana), a conference aimed to preserve Mexico’s Culinary Traditions. When the day was coming to a close and I decided to head outside during the golden hour. I thought I’d watch the sunset from outside the halls of the presentations and culinary delights and catch a moment in the city. It was my first visit to Puebla. Taking a bus through Puebla early in the morning after my late arrival via Mexico City, I had no idea of the location of the FMGM at the Centro Expositor Puebla. To my surprise walking up a slight incline I found an adjacent park and made my to this view of the city an distant mountains. I watch the sky explode with brilliant streaks of color contrasted against the dark ominous clouds. In the distance was the Popocatépetl, the legendary volcano part of the Puebla skyline. Wait, maybe the sky exploding wasn’t something I wanted to see here. 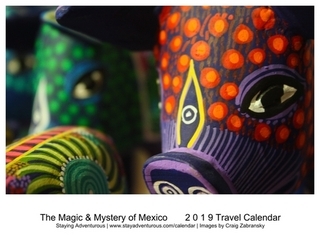 Puebla is the one state in Mexico where Cinco de Mayo is actually a celebrated holiday. Also, it was no surprise the gastronomy conference was held here, it has an amazing culinary scene with must try Moles, Cemitas, Chalupas and more. Another must – catching a Lucha Libre match in the city on Monday nights. Mexico Location, Where is Puebla? Puebla, located in central Mexico is bordered by the states of Veracruz; to the north and east, Mexico, Hidalgo, Tlaxcala and Morelos; to the west, and Guerrero and Oaxaca; to the south. The image was selected for the 2016 Sunset Calendar. I never thought I’d witness such a sky and scenery walking outside the conference. This sunset reminds me to make sure I do take a moment each day to walk outside and experience the magic at sunset hour, to see the sky showcase its colors and to be present in the moment. Also, for more details on the city of Puebla itself, listen to my Staying Adventurous Podcast, A Taste of Puebla. This post is part of the Mexican March Madness 2015 Campaign, a look at the 31 United States of Mexico in the 31 days of March. Don’t miss a state, sign up for email updates > here. And special thanks to FMGM for inviting me to attend its 2nd annual conference in Puebla. but did you get to eat anything delicious at that conference?? 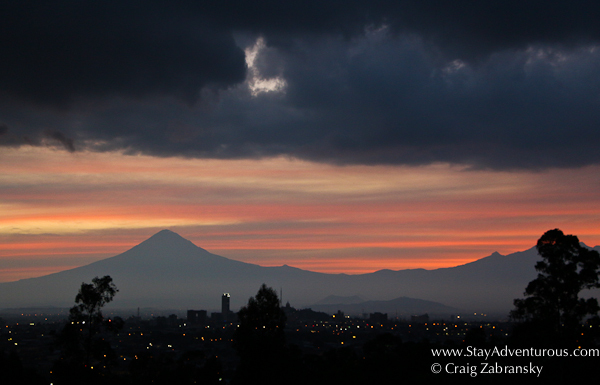 I spent three days in Puebla and never saw the volcano as it was cloudy and rainy. Thanks for showing me the light. Hope this makes a future #sunsetsunday calendar.